After our little detour to the Ash Meadows National Wildlife Refuge, we went back in to Death Valley. We stopped off at Stovepipe Wells, a small waystation in the middle of the desert to grab some food and proceeded on our long drive through the valley to the Ubehebe Crater. We’d hoped to be able to visit Scotty’s Castle after hearing about its legends, but as is tradition, it was closed for renovations. The story of Scotty’s Castle was incredibly interesting, we had watched a mini documentary on it (and the history of Death Valley) at the rangers station the day before. A man named Walter E. Scott had tried to set up a mining operation within Death Valley, and been unable to secure funding. Instead, he started to claim that he already had a successful mining operation set up, and sought patronage. In this he was successful, being sponsored by a man named Albert Mussey Johnson. One day, Johnson went out to visit Death Valley and see how things were going. On this trip he discovered Scott’s fraud, and the two men had something of a falling out. Johnson, seemingly finding Scott’s scheming ways entertaining, was able to forge a friendship with him afterwards. As this friendship blossomed, Johnson and his wife (Bessie) moved out to Death Valley. Here they build their dream home, a two-story Mission Revival and Spanish Colonial Revival style villa. They named it Scotty’s Castle, in honour of their friend (who was to spend much time there with the couple). Although a popular tourist spot, Scotty’s Castle was severely damaged by flooding in 2015, and was closed for repairs. It is due to be reopened some time in 2020. Up in the north-west area of Death Valley, not far from Scotty’s Castle, is the Ubehebe Crater. This is a volcanic crater, estimated to be between 2 and 7 thousand years old. The above photo doesn’t really capture well just how huge this crater is. It is around 1km wide, and 237m deep. The wind was incredibly strong here, and the ground loose underfoot. Because of this, warning signs are dotted around the edges. 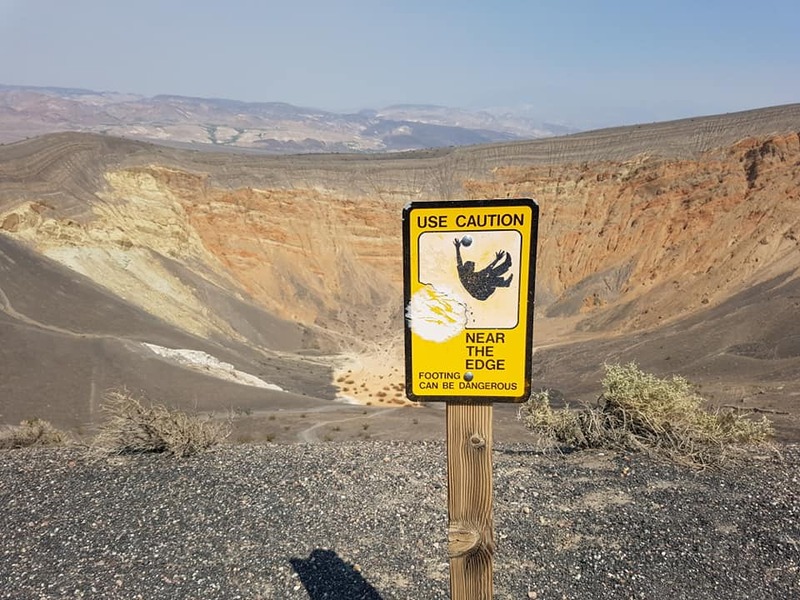 Having learned the previous day that Death Valley warning signs are not to be ignored, I didn’t go near the edge. The human history of the site is quite interesting. The Timbisha (“rock paint”) Shoshone Tribe, located in the area, refer to the giant crater as “Tempintta Wosah” meaning “basket in the rock”. According to a sign nearby, Timbisha legend places the Ubehebe Crater as the origin of humanity; we all started there, and then headed off in to separate directions to found our own nations. Because of this it is considered a sacred site by the Timbisha. By this point we were almost 200 miles away from Vegas, and so began our lengthy drive back. We stopped off for some dinner at a Denny’s on the way back. 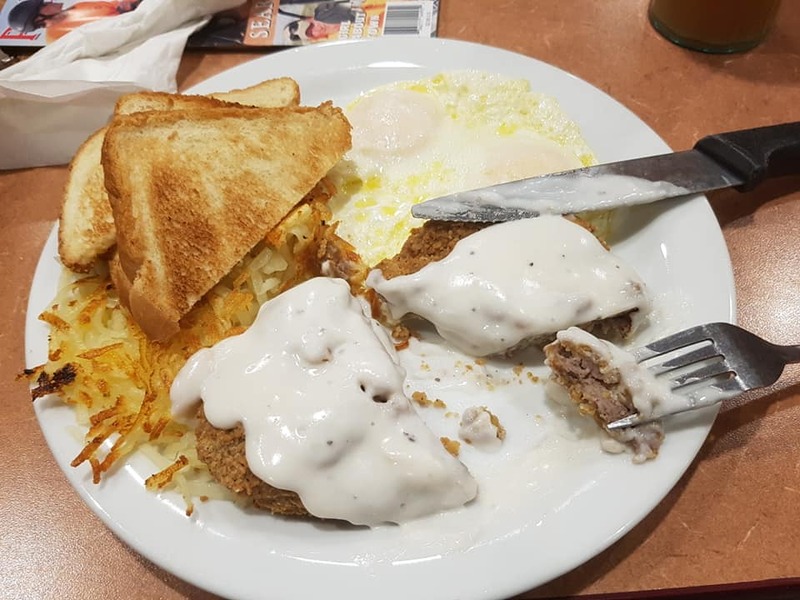 Here I discovered another amazing American concept: chicken fried steak. Later in the trip I would learn that most things can be chicken fried; it appears to just mean breaded and fried. Chicken fried bacon was a real winner for me! 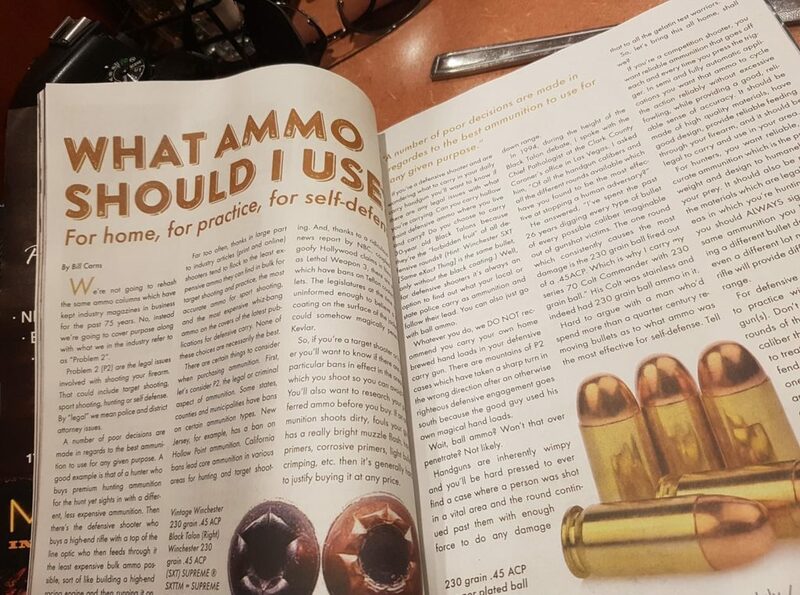 It’s so very American to me- what ammo should I use? It features an interview with a local coroner on what types of ammo seem to have the highest rates of lethality. Beautiful. This marks the end of my Death Valley adventure. Next up was a few days in Vegas attending conferences and generally having some fun!